Monsters come in many guises. No one knows better than Bruno DiCesare, whose ancestor was cursed centuries ago by none other than Leonardo da Vinci, whose experiment to create an actual Vitruvian Man went horribly wrong. The beast within Bruno prevents him from mingling with people – except during Carnevale. The festival provides him ten days of glorious freedom. Ten days of freedom isn’t enough for Melina Weaver, whose work at the Institute has taken a frightening turn. She’s ordered to experiment on inmates, but she never signed on to create monsters of men. Carnevale might provide more than a temporary escape, especially after she meets Bruno. Brought together by accident, bound by fate—and magic. Love works its charm over Bruno and Melina, but each one holds a secret. Bruno thinks his secret will drive Melina away. Melina’s afraid Bruno will hate her for what she’s become. He’s become her world, but his world is full of monsters who want to destroy them. Thanks to Decadent Publishing, who first published this story as The Vitruvian Man trilogy of novellas (Cursed, Charmed, and Claimed) in 2013. "A spellbinding tale of love, mystery, suspense and intrigue like no other"
"A unique blend of historical facts and paranormal elements that combine in an action-packed romantic story"
"A magical novella that will surely engage the imagination of a reader"
The previous novellas totaled 66,528 words. 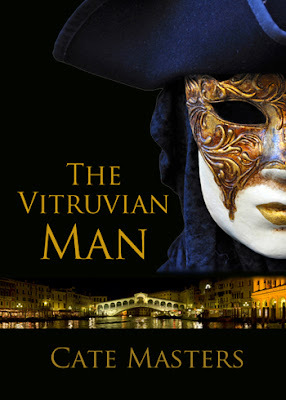 After revisions, which included cuts as well as additions, the word count for The Vitruvian Man novel is now at about 83,000. I hope you'll love this story as much as I do!